"The Friends of The Head Harbour Lightstation"
Geographical position: Passamaquoddy Bay, New Brunswick. During the Napoleonic Wars, when Britain and the United States were at economic war, the town of Eastport, Maine grew rapidly as a smuggling canter. Campobello Island, on which Head Harbour Lighthouse was built (part of New Brunswick, but only 12 km away from Maine's coast), also became a trade canter. During the 1820s, trade flourished and traffic grew between Campobello Island and the Maine Coast. Fishing, shipping, and shipbuilding were very important activities in Passamaquoddy Bay, but the famous Fundy fogs, high tides, and treacherous rocks around Campobello Island bit into the profits and hearts of seafaring traders. Head Harbour's light was the first Canadian response to this danger, built to warn sailors approaching the craggy rocks and shoals around Campobello Island. Former American President Franklin D. Roosevelt spent his childhood summers and contracted polio on Campobello Island. The Tower is designated as a classified heritage building. It is still used as a lighthouse but is no longer manned. · The Lighthouse, Dudley Witney (1975) McClelland and Stewart, Toronto. Head Harbour, New Brunswick, is the site of one of the oldest lightstations in Canada. Established in 1829, it is situated on a rocky outcropping at the northern tip of Campobello Island. The station now includes five structures: the light tower itself (1829), the adjoining dwelling (construction date unknown), a fog alarm building (1914-15), a work shed (1914-15) and a boathouse (1947). The boat house was declared surplus to Canadian Coast Guard needs and was considered by the FHBRO (87 129) in 1988. It was not recognized, and the Canadian Coast Guard intends to remove it. The other four buildings have been submitted by Transport Canada for a FHBRO review; no particular action is anticipated for any of these buildings. Head Harbour lightstation occupies all of the rocky point/island on which it is located. Since the tower and dwelling were built, there has been some change in the buildings at the site. The boathouse, built in 1947, is the most recent structure. The essential character of the site, however, has not changed. HISTORY OF LIGHTHOUSE: The Head Harbour Lighthouse has a long history as an aid to navigation in the Bay of Fundy and Passamaquoddy Bay. It is located at the northern extremity of Campobello Island, which is the largest of a number of islands in the area of Passamaquoddy Bay near the Maine-New Brunswick border. The light is known to local residents as "East Quoddy Light". Campobello Island is closer to the coast of Maine than it is to New Brunswick. Twelve miles by sea to St. Andrew's, its road link with the Canadian mainland is by way of a bridge to Lubec, Maine and a sixty mile drive through that state to St. Stephen. The island is probably best known as the site of Franklin D. Roosevelt's summer home; it was here that he summered as a child and here that he was stricken with polio in 1921. The family "cottage" is now at the center of the Roosevelt Campobello International Park, established in 1964. During the Napoleonic Wars, when Britain and the United States were engaged in economic warfare, the town of Eastport on the Maine shoreline across from Campobello Island grew rapidly as a smuggling center. 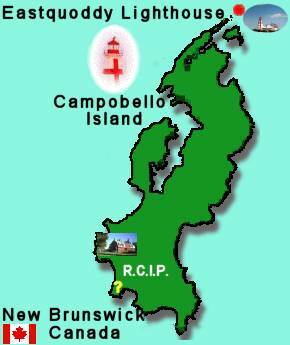 On the New Brunswick side, Campobello became a transfer point for trade as well. As the Islanders said, "That's why fogs were made''. Although the illicit trade declined by the 1820s, general trade flourished and traffic grew in the narrows between Campobello Island and the Maine coast. Fishing, shipping and shipbuilding were important activities in Passamaquoddy Bay, but the famous Fundy fogs, the high tides, and the treacherous rocks and shoals around the islands near Campobello Island presented considerable difficulty to this marine community. The first light in the region was the American West Quoddy Light, established in 1808 on the Maine coast at about the level of the southern point of Campobello Island. The first light in New Brunswick was established in 1791 at St. John Harbour. The second was in 1829 at Head Harbour, where it was felt that "trade would be benefited and possibly vessels and lives saved" if the point were lit. Others followed: Gannet Rock and Point Lepreau in 1831, Machias Seal Island in 1832 and Quaco in 1835. By 1832, the New Brunswick Lighthouse Commissioners were so pleased with the state of affairs they reported "an increase in lights would rather tend to perplex and embarrass the mariner on his voyage seaward." The volume of coastal trade along the Bay of Fundy and the coast of Maine increased with the l9th century, and the chain of lights in the dangerous Passamaquoddy area was strengthened by a number of other lights. 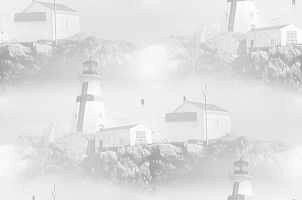 An upgraded fog alarm was installed at Head Harbour in 1880 in response to repeated requests from mariners, and in 1885 a second light was established on Campobello Island at Mulholland Point near the site of the modern bridge to Maine. Today, the waterways in the region are still busy, and the natural hazards to navigation have not diminished. The Head Harbour light continues, after over 150 years, to provide an essential service to the marine community in the area. The Head Harbour lightstation is about two and a half miles from the nearest community, Wilson's Beach. The rocky outcropping on which the station is set becomes an island at high tide and is connected with the main body of the island by more of these rocky quasi- islands. A road from Wilson's Beach runs to a spot within walking distance of the lightstation. Beyond that point, the station is accessible by foot at low tide. At the time it was built, the station was relatively isolated, and it is unlikely that its establishment played any significant role in the development of nearby communities. The tower's wooden, shingle clad exterior is painted white with a distinctive red cross. The 51' octagonal structure is tapered. It was built in 1829 using heavy timber; the original lantern was replaced by the current cast iron model in 1887. The distinctive daymark in the form of a red cross has been on the tower at least since Confederation. The principal decorative touches are the flared cornice supporting the lantern base and the shaped hoods over the windows which have been placed on all but one of the faces of the tower. The tower is attached by a covered walkway to the dwelling, and it is also accessible from outside by a door on the southwest side. The stone foundation has been covered by cement. While the structure has been reshingled and painted many times, and the daymark extended to all elevations, photographs show that since 1902, at least, the appearance of the tower has changed very little.